After commandeering a Confederate locomotive, heroic Yankee soldiers known as the Andrews Raiders try to bring about an early end to the Civil War by crippling the Southern railroad network. But their efforts are hampered by the unrelenting bravery of a single Rebel patriot. Harvey Henkelmann (United States) on 2014-08-04 21:56:04. It's a real treat to see Disney movies in all their glory, back when movies actually meant something, unlike today's special effects-ridden garbage. Of all the films dealing with the Andrews Raid, I find this to be the most realistic portrayal by far. I recommend this movie to all historians and rail enthusiasts. Bennett (Albany, NY) on 2013-06-26 11:05:12. 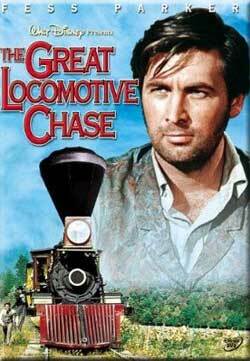 The Great Locomotive Chase from Disney is one of the best movies ever made about a real event. It recreates history as accurately as possible. It is about the Andrews Raid of Apr. 12, 1862 in which Union men, (behind the lines and in civilan clothing), tried to hijack a Confederate train and prevent the Confederate soldiers from reinforcing their army during a Civil War battle by destroying bridges and track in their wake. The event was the inspiration for the mostly fictional film; The General (1927) with Buster Keaton. Fess Parker is cast as James J. Andrews, while Jeffrey Hunter is cast as Confederate Conductor William A. Fuller. Many of the Union soldiers who took part in the raid were the first Americans awarded the Congressional Medal of Honor. There is a great deal of train action in the film. There are no extras with the DVD. You get the movie and that's about it. It's mostly G rated and violence is kept to a mimimum, but, it is a war film about an event that did occur and a lot of the actual people that took part in the raid were killed after it was over. Rob (California) on 2010-10-11 16:46:31. This is a great train movie and story in the Disney tradition. I watched this movie as a child and again as an adult. Fess Parker, then famous as Davy Crockett, was at his best in this action adventure. I would highly recommend it to children and adults. The movie shows the important history of trains in the forming of our country. I like history that is tied to trains and this one really fits the bill. I'll watch this one more than once.